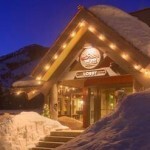 The Inn at Jackson Hole is not available for online booking. Please submit an inquiry or call our agents to get pricing and availability information. 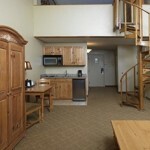 All Rooms, Suites, and Lofts at The Inn offer, cable TV, 30 min. of free local calls, complimentary long distance access, complimentary wireless high speed internet access, coffee and tea maker, iron, ironing board and toiletries. One Bedroom Hotel Suite- These suites offers a queen bed in the master bedroom and queen sofa bed in the living area to sleep up to 4 people. They come equipped with a full kitchen, outfitted with plates, silverware, pots and pans, and finished with granite counter tops, microwave, stove, refrigerator, and custom wood cabinets. This room also includes a dining area and inlaid fireplace. Two Bedroom Hotel Suite- These two bedroom suites are appointed with a queen bed in the master bedroom, two queen beds in the second bedroom, and a queen sofa bed in the living area to sleep up to 8 people, two full baths, and an inlaid gas fireplace. These rooms also come equipped with a full kitchen finished with granite counter tops and outfitted with plates, silverware, pots and pans, microwave, stove, refrigerator, custom wood cabinets and a small dining area. Deluxe Loft- This spacious loft has a king bed in the loft with a second television and a queen sofa bed on the main level with an inlaid gas fireplace with a private balcony. 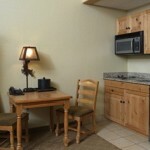 The kitchenette includes granite counter tops, mini refrigerator, microwave, stove, sink, and a small dining area. Premium Loft- This spacious loft features high vaulted ceilings, a king bed in the loft with a second television and two queen beds on the main level. Family Loft- On the main level this loft includes a king bed and a queen sofa bed, and another queen bed in the loft. This room also has a kitchenette with granite counter tops, mini refrigerator, microwave, a stove, sink, and dining table. Deluxe Room- These rooms include a king sized bed with a sitting area, a wood inlaid gas fireplace, a sleeper sofa, and a dining table and chairs. Also included is a kitchenette outfitted with plates, silverware, pots and pans, and finished with granite counter tops, mini refrigerator, microwave, a two burner stove, sink and custom wood cabinets. 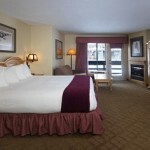 Standard Room- This rooms comes equipped with a king sized bed or two queen sized beds and a full bathroom with marble countertops. The Inn at Jackson Hole is a non-smoking facility. Pets Allowed. There is a $10 per night pet fee. Maximum 2 pets per room.